When club director Josh Rutherford set up Tiny Woods Football Academy back in July 2013, he could never have imagined just how far it would have come in its five-year history. Tiny Woods Academy, football coaching aimed at promoting inclusion and well-being for children aged between four and 13, has spread its wings, and evolved into the new Amble East End Football Club. Running parallel to Tiny Woods Academy, Amble East End comprises a Junior section, and an Over 40s Walking Football section. What began as a dream for Josh, has developed into a reality with the help and support from Amble’s local community. A simple concept which is growing and growing. Josh proudly oversees the establishment of his new club, as well as undertaking, single-handedly, all training sessions, for between 50 and 60 club members, ranging in age between two and 68. Alongside regular training, he also hosts football camps for the Juniors of Amble East End during school holidays, as well as friendlies for the Walking Football section. Both Tiny Woods Academy and Amble East End are proud to have many affiliations within the community of Amble. Special thanks must go to: The Radcliffe Club; Akzo Nobel; Quest UAV Ltd; Styles by Helena; and Bengal Spice Tandoori, all of which have generously sponsored Amble East End’s new venture to date. The Junior section regularly supports Blyth Spartans Football Club by way of providing club mascots on match days. Spartans defender Nathan Buddle has recently become an ambassador for Amble East End Junior section. The club, although in its infancy, is gathering momentum and has now established its committee officials. 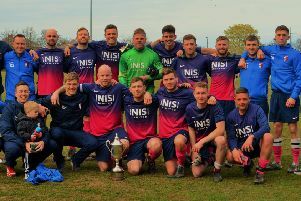 A huge campaign was undertaken in Amble in recent months to raise much-needed funds for Amble East End, to provide team sponsorship, secure long-term training facilities, equipment provision and kit. By way of celebrating the club’s achievements to date, it has secured a deal with ex-Newcastle United legend John Beresford, who will be visiting The Radcliffe Club, Amble, on March 31, at 7pm. Tickets are on sale now at £10 each, which includes refreshments and free raffle entry. Corporate tables for up to four guests are of limited availability at a cost of £60. Tickets are available from Josh Rutherford, director, on 07714 862292, and Andrew Ryder-Somerville, walking football manager, on 07522 706185.